On 22nd December 2018, after a busy and exciting year of events, new partnerships and projects, Avnish and Anita Goyal embarked on a trip to India alongside their two daughters – Simran Goyal and Simran Sehmi – to see some of our partner projects in action. 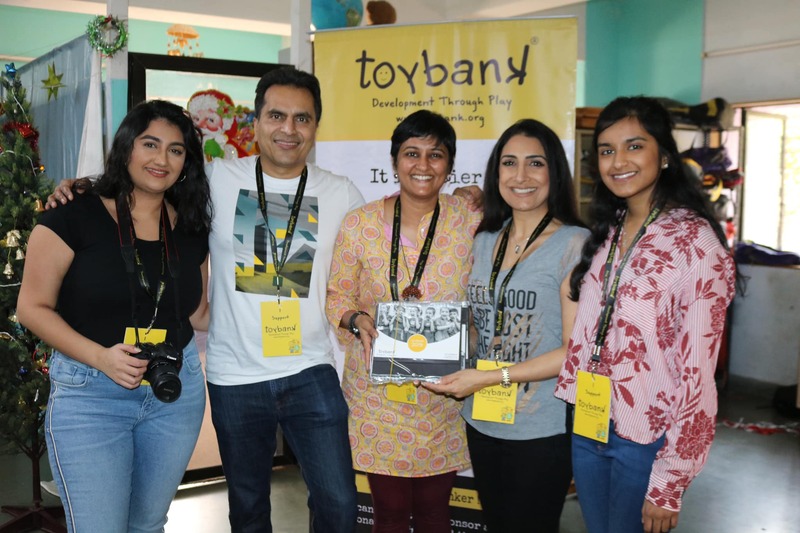 The visit to Toybank gave HGF the opportunity to visit a development play centre in Mumbai. Anita, Avnish and family had the chance to engage in a number of games and activities with the children, and hear from project leaders how the programme has developed throughout the course of 2018. It was incredible to see how the leaders not only organise activities for the children, but also arrange the games and toys according to areas of development and how they will stimulate the children’s learning through play. Sense International works with the families of children living with deafblindness in Navi Mumbai. The visit gave HGF the chance to meet the incredible support team whose mission is to make mobility, learning, communication and understanding easier for the children with deafblindness. 95% of what we learn comes from our sight and sound, so it was a unique experience for Simran S to be able to learn a few pieces of sign language using only the sense of touch to identify words being spelled out on her palm. Doorstep School is a cause that we have been heavily committed to in 2018, as we raised funds to introduce an HGF-funded bus to open later in 2019. Following Avnish and Anita’s visit to the project earlier in February 2018, it was amazing to see the developments the project have made over the year. It was a special honour to see HGF named on the side of the existing bus in Mumbai, and have the opportunity to meet some of the children benefitting from this programme. The EKTA project, run by the Cherie Blair Foundation, helps women entrepreneurs in the area of Pune, providing 40 women with education in skills training and business acumen. These women manufacture products from shampoo to dried garlic, which are then sold through a cooperative shop created with the project’s support. Together, these women have created a community where they work together and inspire eachother, giving each the courage to pursue their learning and success. The fifth and final visit of the trip was to Prerana. Prerana’s project works to eliminate inter-generational trafficking, and HGF were able to visit one of the project centre’s to hear in particular about the life skills that children engaged with the programme are encouraged to learn. Educating the mind without educating the heart, is no education at all.